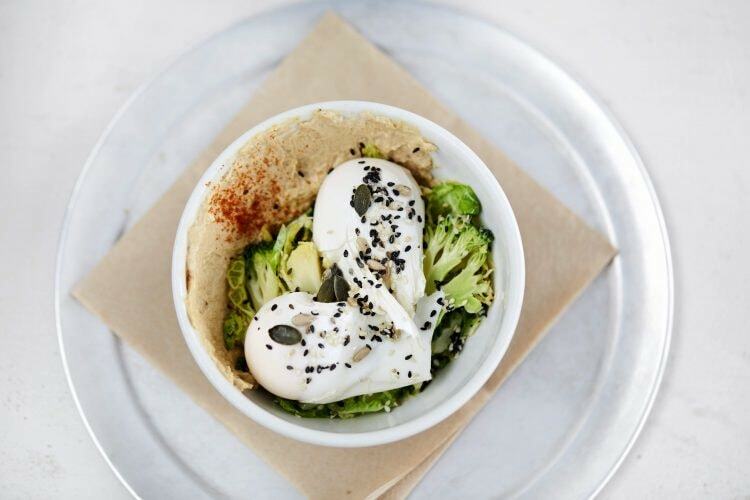 As the rise in interest surrounding vegetarian and vegan-friendly living continues, West London adds to its ever-growing list of speciality restaurants and eateries. Embrace the veggies in these reputable hotspots, which offer meat- and dairy-free dishes that don’t compromise on flavour. Everything at The Good Life Eatery is made fresh on the day and covers a wide range of specialist diets: vegetarian, vegan, gluten-free and dairy-free. Even the environment’s a winner when it comes to this stylish establishment as the business works to source ingredients as locally as possible and support the local community with its employment choices. The original branch is situated on Sloane Square, and a further four have opened in similarly well-heeled areas: Marylebone, St John’s Wood, Belgravia and Notting Hill. In the mornings, you can build your own avocado toast, and the Shred breakfast comes highly recommended. 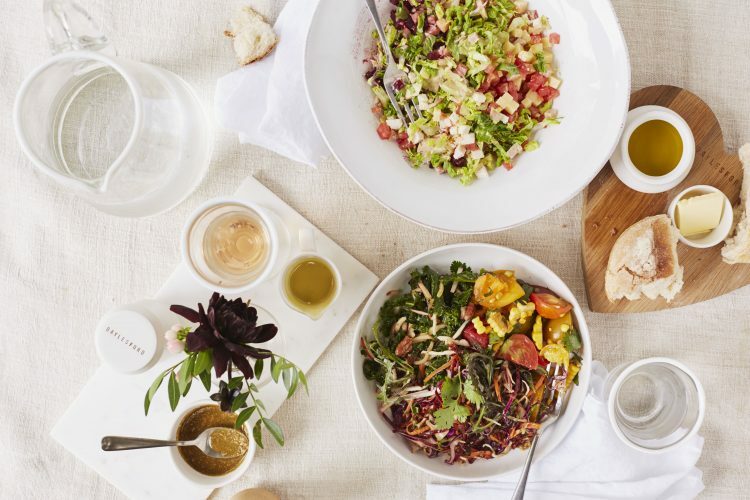 Come lunchtime, the superfood salads and warm bowls strike a balance between hearty and healthy. Those who follow Ella Mills (otherwise known as Deliciously Ella) on social media will be familiar with her wholesome vegan recipes. Her London café is open in time for a pre-work coffee and boats seasonal menus, but expect speciality stews and soups as a mainstay, all vegan-friendly and designed to nourish. If you’re passing by in the afternoon, a sweet treat like the peanut cookie or banana bread won’t disappoint. Melbourne-raised Rose Mann was one of the first people to make the vegetarian dining experience ‘cool’ when she launched Farm Girl in 2015. The space, now famous with the city’s healthiest and most Instagram-savvy consumers, features a small courtyard, pink tables and rustic crockery, which complement its well-presented breakfast and lunch dishes. The jackfruit tacos and vegan BLT (which replaces bacon with a coconut variation) both come highly recommended, and there’s a lengthy list of hot drinks that use ingredients like charcoal, turmeric and matcha in place of coffee. Bypass Neal’s Yard in Covent Garden and head for by CHLOE. to get your vegan foodie fix instead. It’s positioned on the edge of the main square and offers a bright, open space and a fast-food-style concept where dishes are served on recyclable card and wrapped in paper. Early-morning customers get the pleasure of the breakfast and brunch dishes, which include the classics and some unusual options like scrambled tofu and maple sausage, and for lunch and dinner, expect plant-based burgers and pasta as well as salads and a range of sweets. 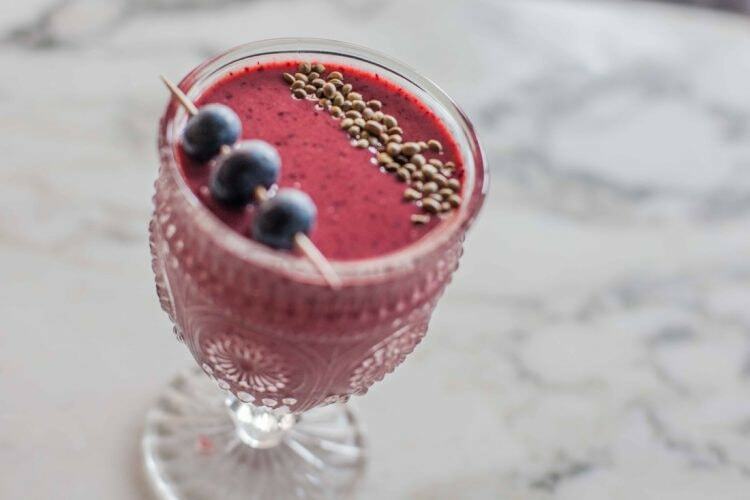 Vegetarian, vegan or otherwise, there’s simply nothing not to like about Farmacy, the trendy Notting Hill hotspot serving health-conscious food and clean cocktails. Unlike some of London’s other vegan establishments, it does serve alcohol, and in the evening, the cosy booths and dim lighting make for a relaxing place to unwind. Weekends are a popular time to visit, too, so things are a little more lively. However, with raw granola, artichoke pizzetta and kimchi bowls on the brunch and lunch menus, there’s little question why. Those looking for quieter surroundings can book the private room for dedicated events. The Gate prides itself in coming up with experimental recipes, presenting exciting new dishes and enticing even those usually put off by plant-based menus. The Hammersmith branch is one of three currently operating in London, with an additional planned to open in St John’s Wood in 2019. The website also lists a selection of its most popular recipes so that you can re-create your favourite dishes at home. Redemption Bar’s tagline reads: “spoil yourself without spoiling yourself”, which sums up the concept perfectly. Even the bar menu is virtuous – it’s alcohol-free, but the concoctions are so tasty that you’ll hardly notice the difference. We suggest trying an Apple Mockjito as a cocktail substitute or opting for the Pure Salvation, which promises to do exactly what it says on the tin. Food-wise, the vegetarian maki roll platter and Redemption’s own riff on banoffee pie made with Medjool dates and coconut cream are must-try dishes. Daylesford Farm originated in the Cotswolds, but its bright and airy London restaurants offer a taste of the sustainably sourced, organic produce on offer at its flagship location. 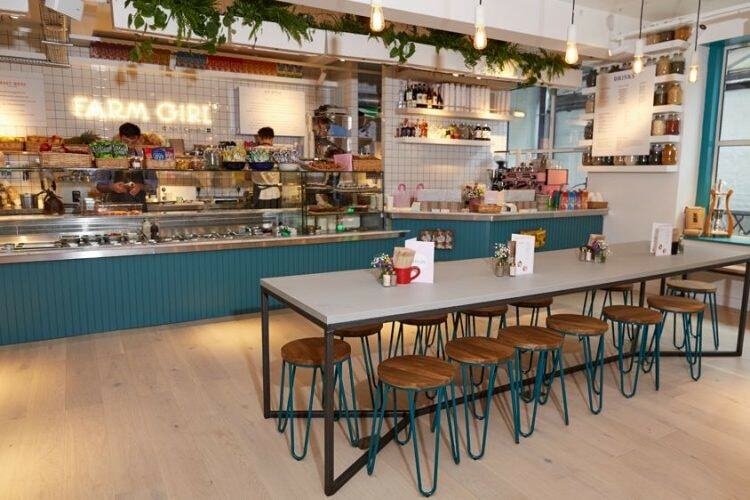 The Brompton Cross shop and restaurant is particularly welcoming with its farm shop and to-go counter on the ground and basement floors and its seated dining area on the first floor. Vegetarian and vegan options on the menu are wholesome, full of flavour and concocted using the best seasonal produce, and dishes are made fresh on the premises. Those looking to elongate their experience can book into the adjoining Bamford Haybarn Spa, which offers beauty treatments and yoga classes on the premises. 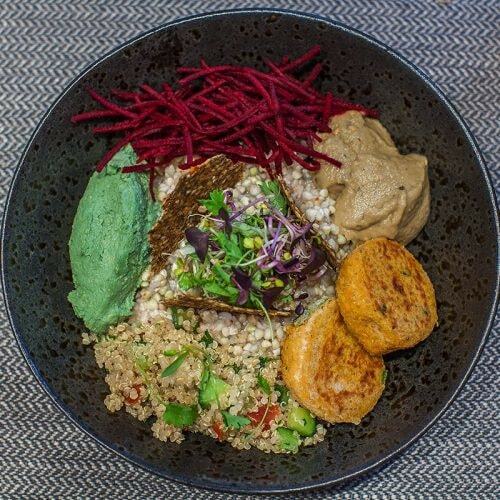 Launched in 2004, 222 is one of London’s longest standing vegan restaurants and draws from natural, raw ingredients in an environmentally friendly manner. Visit its leafy West London location for lunch and stock up at their salad bar if you’re on the run, or dine in. It’s a welcoming establishment with taste and quality at its core. 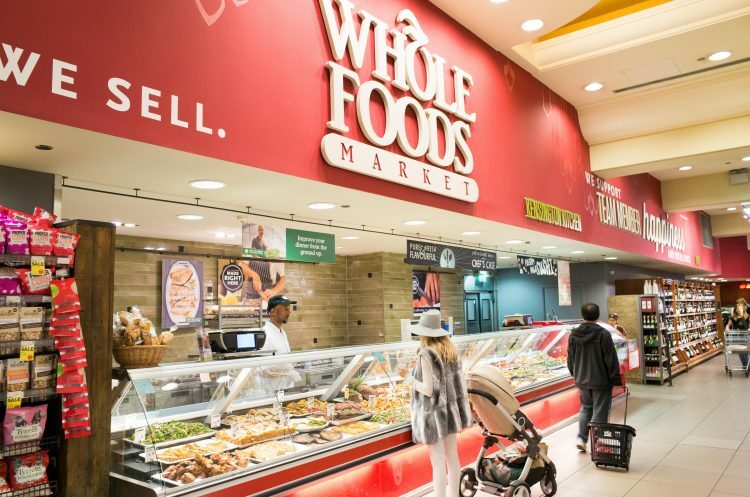 Not just a place to do your weekly health-food shop, Whole Foods Market in Kensington features an entire floor dedicated to dining in. It prides itself on foods that offer a culinary trip around the world, so expect fresh salads, sushi by Sushi & Robata and a Bone Daddies nestled among the usual pizza, burrito and stir-fry options. There are meat recipes here, too, but the choice is varied, making it a perfect place to meet up with people who don’t share your dietary preferences. Indulge in a caffeine hit from the in-house roastery before heading downstairs to stock your cupboards with all the things you never knew you needed.